The personality tests used in job selection are concerned with the aspects of your personality that will affect your suitability as an employee. 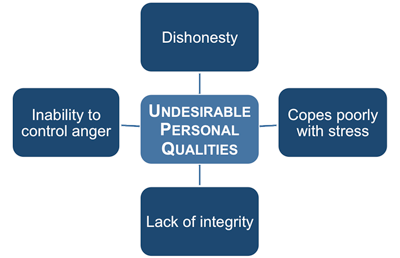 There are some personal characteristics which are seen as universally desirable and some that are seen as undesirable. These are independent of the job you are applying for and it is very important that you are aware of these. Many job seekers forget that employers are always looking for these personal qualities in their employees. 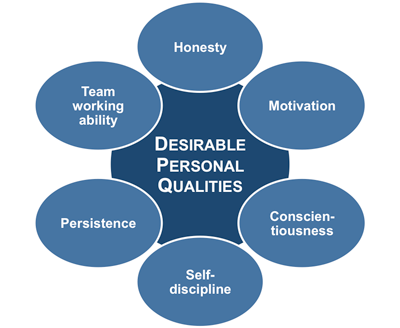 If an potential employee seems to be missing any one of the personal qualities listed above then they will almost certainly be screened out by the personality test. This is true even if the job they are applying for does not explicitly require the personal quality in question. For example, even if you are applying for a job that does not explicitly require 'team working ability', your personality test results will still need to show this personal quality or you run a very high risk of being screened out. These essential personal qualities are described in detail later. It would be difficult to find an employer who would offer a job to anyone who appeared to have any of the undesirable personal qualities. Any doubts about your honesty or any hint of a tendency towards angry or violent behavior will put you out of the running immediately. This seems reasonable; employers have enough problems without hiring dishonest or violent people. However, even if you are scrupulously honest and not prone to anger, the way that some questions are interpreted can cause doubts to be raised about both your honesty and your stability. These questions appear more frequently in personality tests in the USA than elsewhere. The important thing is that tests that use these questions are not interested in mitigating circumstances. They want clear answers and they had better be the right ones. Whatever you may think privately, you should strongly agree with all of the following types of questions. You should strongly disagree with all of the following types of questions. You need to be perceived as someone with a rigid sense of right and wrong and with no room for moral ambiguity whatever the circumstances. You should never admit to even knowing anyone who has engaged in crime of any sort or who has ever used drugs. Again, these questions appear more frequently in personality tests in the USA than elsewhere and once again they not interested in mitigating circumstances. Any hint that you are prone to anger at work will most likely mean the end of your job application. These types of question may also refer to vandalism at work, including computer viruses and hacking. You need to make it clear that you regard this kind of ‘revenge’ unacceptable. You should strongly agree with all of the following types of questions. You need to be perceived as someone who disapproves of anger and anger generated behavior in the workplace. You need to show that you cope well with stress and that you have not and suffered any stress related health problems. You should agree or strongly agree with all of the following types of questions. You should disagree or strongly disagree with all of the following types of questions. You need to show that stress has minimal impact on your relationship with others in the workplace, that it does not affect your productivity and that it has never led to any time off work. ﻿Personality Tests Introduction, Why You Need to Understand Them, How They Work, How Many Personality Traits Are There?, The Big 5 Aspects of Personality, How Personality Profiles are Used, Your Personality at Work, Testing for Honesty, Integrity and Stress, Negative Aspects of Personality, Motivation, Extraversion and Leadership, Can You Beat the Personality Test, Understanding the Personality Test Industry, Even Popular Tests are Controversial and Best Practice Guidelines for Personality Tests.